Welcome to the website of TOMS Shoes, LLC (including any of its subsidiaries or corporate affiliates, collectively, "TOMS," "we" or "us"). Any person accessing or using the website and any associated webpages (collectively, the "Website") is referred to as "you". Unless otherwise noted, the Website, its features, functionality, and all materials, including, but not limited to, images, text, graphics, logos, descriptions, data, illustrations, designs, icons, photographs, video clips, audio clips, sounds, files, trademarks, trade dress, software, specifications, advertisements, titles, names, written materials, User Generated Content (as defined below), Digital Content (as defined below) and any other materials that appear as part of or on the Website (collectively, the "Content"), are protected by copyright, trade dress, and/or trademark laws of the United States, and all worldwide rights, title and interest in and to the Website and Content are owned controlled, and/or licensed by TOMS®. Please note that certain trademarks, product names, company names, logos, service marks or material displayed on the Website may be owned by third parties, and you understand that you are not authorized to display or use such without the prior written permission of the relevant third party. Except as may be expressly permitted by TOMS®, you may not use, reproduce, copy, publish, transmit, distribute, display, modify, perform, download, license, create derivative works of, reverse engineer, frame, transfer, sell or participate in any sale of, or exploit in any way, in whole or in part, any Content, the Website, or any related software; provided, however, that you may download certain Content as indicated on the Website for your personal, non-commercial use only. You are hereby granted a non-exclusive, limited and revocable license to view the Content on the Website, but only while accessing the Website. In addition, you are hereby granted a right to download certain Content as expressly permitted by TOMS on the Website, including but not limited to the Digital Content provided as part of the TOMS Passport Rewards Program set forth in Section 13 below; provided, however, that where TOMS expressly permits you to download certain Content as indicated on the Website you may do so only for your personal, non-commercial use and subject to any additional restrictions provided by TOMS either in these Terms and Conditions, on the Website or elsewhere as may be indicated by TOMS. No right, title or interest in or to any downloaded Content or software is transferred to you as a result of any such permissible downloading or copying. ELIGIBILITY: TOMS Passport Rewards ("Program") is open to legal residents of the fifty (50) United States and District of Columbia, 13 years of age or older. Employees, officers and directors of TOMS are not eligible to participate. VOID WHERE PROHIBITED BY LAW. PROGRAM REGISTRATION: In order to be eligible to earn points, you must first create a TOMS.gr account by completing the free registration process on the Website and agreeing to participate in the Program. Limit one (1) account per person/email address. HOW TO EARN POINTS: You can earn points as part of this Program by participating in various activities listed on the Website and on TOMS.gr/Passport ("Rewards Website"), including, but not limited to, social media activities and product purchases (each, a "Qualified Activity" and, collectively, "Qualified Activities"). Each time you return to the Website to complete one or more Qualified Activities, you must login in order to receive credit for those completions. The types and duration of Qualified Activities will vary from time to time. The latest information about Qualified Activities will be available on the Rewards Website, so please check back regularly. Purchases: If you wish to earn points through purchases on the Website and/or on TOMSSurpriseSale.com, you will earn one (1) point for every USD $1 spent on qualifying purchases on the Website when you are logged into your Program account on the Website. Qualifying purchases include regular and sale priced merchandise, but exclude purchases of gift cards (both physical and electronic). Taxes and shipping and handling charges are also excluded when calculating qualifying purchase amounts. You will earn points on the qualifying purchase subtotal, after all discounts have been applied but before applicable taxes, shipping and handling. When you make a purchase, your order will appear on your dashboard showing “Pending Points.” This means you have not been awarded your points yet. You will be awarded your points when your order has shipped. When products are returned for a refund to the original payment method, points will be deducted from your account for the amount of return net of taxes, shipping and handling when the product(s) is/are received at the TOMS warehouse (note: your account may have a negative balance if the dollar amount returned is greater than your current points account balance). When products are returned for store credit, points will not be deducted and the points accrued during the original purchase will remain in your account. Points may be earned on qualifying purchases when TOMS Gift Cards are redeemed. Other Qualified Activities: The number of points you can earn by completing a non-purchase Qualified Activity will be stated on the Rewards Website. There may be limitations placed on how often and/or how many total points you can earn by completing any Qualified Activity, and any such limitations will be stated on the Rewards Website. Social Media Qualified Activities: You can earn points through the various social media Qualified Activities listed on the Rewards Website, such as retweeting a tweet posted by @TOMS, or otherwise sharing or reposting any eligible social media posts by TOMS. Note also that your TOMS account must be connected to your applicable social media accounts in order to earn points. As with other Qualified Activities, there may be limitations placed on how often and/or how many total points you can earn by completing any Social Media Qualified Activity, and any such limitations will be stated on the Rewards Website. You should be careful that your behavior when participating in any of these Qualified Activities will not be deemed "spamming" or in violation of any of the applicable social media platforms' terms and conditions. In the event TOMS determines, in its sole discretion, that you are abusing these Social Media Qualified Activities, your account may be terminated and any points earned for these Qualified Activities will be forfeited. You agree not to abuse the Rewards Website and any social media platforms connected to the Program by conduct which is detrimental to the interests of TOMS, including without limitation, attempting to accrue points or redeem points in a manner inconsistent with these Rewards Terms or the intent of these Rewards Terms, attempting to earn points through illegitimate channels, participating in redemption fraud, or tampering with the Program or its tools. TOMS reserves the right to add, modify and/or delete any Qualified Activity, the points you can earn in connection with completing any Qualified Activity and/or any limitation placed on total points you can earn in connection with any Qualified Activity. For a complete list of Qualified Activities and the corresponding number of points you can earn for each Qualified Activity, please visit the Rewards Website. Recently purchased items will have pending points. Your points will be awarded after your order has shipped or deposited into your account following confirmation of a completed Qualified Activity. Your points deposit and new balance will appear on the Rewards Website. You can go online and view your points balance at any time. Points cannot be transferred or redeemed for cash. Qualified Activity completions or registrations or points generated by script, macro or other automated means will be void. TOMS' decision with respect to the number of points accumulated are final and binding. MEMBER LEVELS/POINT LIFE CYCLE: There are two (2) levels within the Program which are determined by the number of points that you accumulate in your account (each, a "Member Level"). By creating an account, you will be automatically enrolled in the Program at the Explorer Member Level. Earn 200 points and you will proceed to the Trailblazer Member Level. All Program participants will receive exclusive benefits, such as coupons, early access to TOMS.gr sales, and access to two Member Appreciation Sales. Trailblazers receive additional benefits including Free Shipping for a Year and access to four Member Appreciation Sales per year. NOTE: Program participants will be sent emails about up-coming sales, promotions and the exclusive Member Appreciation Sales but only if you're opted in for TOMS Marketing emails. Otherwise, you probably won't hear about these sales. There is an email sign-up at the bottom of every page on TOMS.gr. FREE SHIPPING: As a Trailblazer, you get free shipping for a year subject to the following conditions. This excludes orders that contain only gift card(s). It is only valid on orders shipped to the continental United States with UPS Economy via SurePost only to one shipping address. Choosing any shipping method other than UPS Economy via SurePost may result in normal shipping and handling charges. Offer is not valid on shipments to Alaska, Hawaii, international shipments or other shipments outside the continental United States. No promotional code is necessary; offer will automatically be reflected in your shopping bag but you must be logged into your Passport account. Offer not valid on previously purchased merchandise. 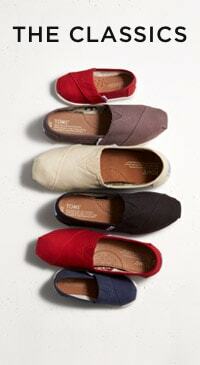 TOMS reserves the right to extend, modify, or discontinue this offer at any time. Points are divided into two life cycles: "Redeemable" and "Lifetime." Your Redeemable points are the number of points you have available to redeem rewards. This number decreases with each reward you redeem, and will increase with the completion of Qualified Activities. Your Lifetime points display the number of points that you have earned since you became an active member of the Program. MEMBER LEVEL EXPIRATION: When you sign up for the Passport Program, you’re automatically an Explorer. If you earn 200 points during the 12-month period after you enroll, you will move up to Trailblazer. However, if you have not earned 200 points within that period, in order to move to Trailblazer, you will need to earn 200 points over the next 12-month period (i.e., points needed to move from Explorer to Trailblazer do not carry forward from one 12-month period to the next and, if Trailblazer status is not achieved, “qualifying” points are reset to zero on each anniversary date of when you signed up for the Passport Program or when your membership level is re-set to Explorer as described below). HOW TO REDEEM POINTS: To redeem your points for a reward item, visit the Rewards Website and follow the directions provided. Each reward item has its own specific points value as set forth on the Rewards Website. REWARDS: Please visit the Rewards Website for a current list of reward items. Once you redeem your points for a reward, your transaction cannot be reversed or refunded. Reward redemptions are final. Reward items will be provided on a first-come, first-serve basis and may be subject to availability, so once a reward item has been depleted such reward item may no longer be available. Additional terms and conditions may apply to Rewards and will be set forth on the Rewards Website. Except as may be set forth in Section 4 of the Terms of Sale, Reward items will be provided "as is" with no warranty or guarantee, either express or implied by TOMS. All reward item details are at the sole discretion of TOMS. You cannot transfer, substitute or redeem rewards for cash. TOMS reserves the right to substitute a reward item of comparable or greater value, at its sole discretion. You are responsible for all federal, state and local taxes as well as any other costs or expenses associated with a reward item not specified herein or on the Website as being provided. Rewards are considered taxable income and are subject to local, state and federal taxes. When the value of the reward items for which you have redeemed points reaches USD $600 or more in a calendar year, a 1099 tax form will be generated and mailed to you for tax reporting purposes. TOMS recommends that you keep all account statements sent to you when you redeem points for reward items for your record keeping purposes. Reward items will be mailed to the mailing address provided at checkout or the email address provided in your Program account, as applicable. Please note that you may be charged shipping and handling fees as noted on the Website (during checkout) for any reward items mailed to you, unless a shipping promotion applies (if any). You are responsible for updating your registration information. No reward items will be shipped to destinations outside the United States. Rewards that can be delivered electronically will be delivered in approximately 48 hours from the date the redemption is fully processed. The Rewards Released Parties (as defined below) shall not be liable for any damages, losses or delays in connection with any shipments. Reward coupon codes will be reflected in your Program account on the Rewards Website and also issued via email to the email address in your Program account. If a reward coupon code expires, the expiration date will be clearly disclosed and reward coupon code must be used by such expiration date or it will be void. Please follow the instructions provided along with the reward coupon code for your specific redemption instructions. Reward coupon codes will generally automatically be issued within 24 hours after your rewards redemption. Multiple reward coupon codes cannot be combined in a single order. Reward coupon codes are not redeemable towards purchases of gift cards (electronic or physical). The reward coupon code will be applied to the qualifying purchase subtotal, after all discounts have been applied but before applicable taxes, shipping and handling charges. If you choose to use your points to help TOMS support one of its various charitable causes, your points donation will not be tax deductible to you. Decisions with respect to how points will be used for such causes will be determined by TOMS in its sole and absolute discretion. Experiential rewards are subject to additional terms to be provided by TOMS. PLEASE READ THE FOLLOWING TERMS OF THIS LICENSE CAREFULLY BEFORE INSTALLING ANY SCREENSAVERS, AVATARS OR OTHER SOFTWARE OR CONTENT PROVIDED BY TOMS IN CONNECTION WITH THIS PROGRAM (COLLECTIVELY, THE "DIGITAL CONTENT"). BY INSTALLING ANY DIGITAL CONTENT, YOU SIGNIFY YOUR ACCEPTANCE OF THE TERMS OF THIS LICENSE AND YOU AGREE TO BE BOUND BY THE TERMS AND CONDITIONS OF THIS LICENSE. IF YOU DO NOT AGREE TO THIS LICENSE, DO NOT INSTALL THE DIGITAL CONTENT. LICENSE FOR PERSONAL USE. TOMS grants you a limited, non-exclusive, non-transferable, non-sublicensable, non-assignable and revocable license to use, copy and install Digital Content in the United States solely for your Personal Use. "Personal Use" is defined as your private, non-commercial use of the Digital Content, including copying such to your hard drive or CD-ROM solely for back-up purposes. You agree not to add to, subtract from or otherwise modify, translate, disassemble, decompile, reverse engineer, or create derivative works of the Digital Content. You may not rent, lease, sell, redistribute, sublicense or otherwise transfer the Digital Content for any reason. You may make only such copies of the Digital Content as are reasonably necessary for your Personal Use, and any copy made by you must bear the same copyright and any other proprietary notices that appear on the copy furnished by TOMS. PROPRIETARY NOTICES. You may not remove, disable or attempt to remove or disable any digital watermarks or other proprietary notices or markings that may be included with Digital Content. TITLE; OWNERSHIP. You agree that TOMS and its licensors shall retain ownership of all of its respective intellectual property rights, including but not limited to copyright, trademark or any other proprietary rights in and to the Digital Content and its components (including but not limited to images, audio, etc.) used to create such. This license is not a sale and does not render you the owner of the Digital Content. Ownership of the Digital Content and all components and copies thereof will at all times remain with TOMS and its licensors, regardless of who may be deemed the owner of the tangible media on which the Digital Content are copied, encoded or otherwise fixed. NO WARRANTIES & LIMITATION OF LIABILITY. PLEASE SEE SECTIONS 10 AND 11 ABOVE. EXCLUSIVE REMEDY. If you are dissatisfied with the Digital Content, your sole and exclusive remedy is to discontinue using the Digital Content. TERMINATION. TOMS may terminate this license to the Digital Content immediately if you fail to comply with its terms and conditions or for any reason in its sole discretion. REVISIONS AND MODIFICATIONS. TOMS reserves the right to make revisions and modifications to this license from time to time. In the event any such changes are made, they will be reflected here, so please check back regularly. GENERAL CONDITIONS: This Program is not valid with in combination any other programs offered by TOMS. By participating in the Program, you (and, if an eligible minor, your parent or legal guardian) agree (i) to release, discharge, indemnify and hold harmless TOMS, its parents, subsidiaries, affiliates, retailers, advertising and promotion agencies, and all of their respective officers, directors, shareholders, employees and agents (collectively, "Rewards Released Parties") from any liability or damages which may arise out of participation in the Program or out of the acceptance, use, misuse or possession of any Reward or products attained, achieved or received through this Program. All applicable federal, state and local laws and regulations apply. The Rewards Released Parties are not responsible for late, lost, incomplete, delayed, inaccurate, garbled, undelivered, misdirected points, reward requests, reward items or other errors or problems of any kind relating to or in connection with the Program, whether printing, typographical, technical, computer, network, human, mechanical, electronic or otherwise, including, without limitation, errors or problems which may occur in connection with the administration of the Program, the tabulating of points, the announcement of the Rewards or in any Program-related materials. Persons found tampering with or abusing any aspect of this Program, who are acting in a disruptive or unsportsmanlike manner or who are otherwise not in compliance with these Terms and Conditions as solely determined by TOMS may be removed from the Program and all points will be void. The Rewards Released Parties are not responsible for injury or damage to participants' or to any other person's computer related to or resulting from participating in this Program or downloading materials from or use of the Website. TOMS reserves the right at any time to modify, suspend or cancel the Program at any time. Any changes TOMS makes will be effective immediately upon notice, which it may give either by posting the new Terms and Conditions on the Website or via e-mail to you. Your participation in the Program after such notice will be deemed acceptance of such changes, so please check back regularly for any updates and changes. All questions or disputes regarding the Program, including without limitation those involving eligibility, participation, fraud and abuse, will be resolved by TOMS. Your participation in the Program constitutes permission for TOMS and its designees to use your name, biographical information, image, likeness and/or statements about the Program for advertising, trade, promotional and other purposes in any and all media now or hereafter devised, worldwide, in perpetuity, without additional compensation, notification or permission, unless prohibited by law. HOW TO CONTACT US: For information about your TOMS Passport Rewards account, to update your account information or to review the most recent terms and conditions, visit TOMS.gr and login into your account. Please have the email address you used to join TOMS Passport Rewards when you contact customer service. TOMS is testing a new way of giving with its Give Card program. TOMS Give Cards may only be activated by persons who are legal residents of the fifty (50) United States and District of Columbia, 13 years of age or older. VOID WHERE PROHIBITED BY LAW. TOMS is in business to improve lives. We are the original One for One® company. However, in connection with our mission, TOMS does so much more. In addition to giving new shoes to people in need around the world, TOMS supports certain projects and organizations that we believe can better someone’s life (each a “Project” and, collectively, the “Projects”). Projects are carefully vetted by TOMS, with a focus on impact, likelihood of success and alignment with TOMS’ mission and values. Selection of Projects is at the sole discretion of TOMS and may be changed without notice at any time. Although many Projects will be community based organizations (a “CBO”), being a CBO is not a requirement of being a Project. Although impact and likelihood of success are important factors when selecting Projects, the Projects we support or invest in are not affiliated with TOMS and TOMS is not responsible for the success of any proposed or selected Project or for the activities (or lack thereof) of any Project. Give Cards have no cash value and may not be redeemed or exchanged for cash or products. By activating a Give Card, you are helping TOMS decide how to allocate a portion of its annual giving budget. If you choose shoes when you activate your Give Card, TOMS will provide a new pair of shoes to a person in need through our network of established Giving Partners. If you choose a Project when you activate your Give Card, TOMS will provide support to the work of a Project selected by TOMS in its sole discretion based on the specific needs of each Project. At this time, you will not be able to direct which Project will be supported or direct support towards particular activities or Projects. 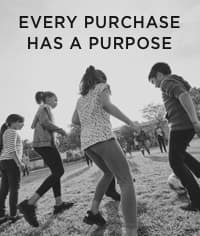 Further, as you are helping TOMS elect how to allocate its annual giving budget by activating a Give Card, activations are not tax deductible and you should not claim a tax deduction in connection with your activation of a Give Card. TOMS is not responsible in any manner whatsoever for Give Cards that are misplaced, including without limitation, cards that are lost or stolen. Lost, stolen or damaged Give Cards will not be replaced. Whoever has the activation code associated with a Give Card may activate the card. If multiple attempts are made to activate a particular Give Card, the last person to enter the code is definitively presumed to be entitled to activate that Give Card and prior attempted activations will be disregarded. Give Cards must be activated by the date mentioned on the card. For Give Cards not activated by such date, TOMS will determine in its sole discretion whether to give new shoes to a person in need or support a Project. Selection of Projects by TOMS should not be interpreted as an endorsement by or of TOMS of such projects or persons or organizations associated with such projects. The names and logos shown on the Website in connection with a Project are the property of their respective owners and are typically subject to tradename and trademark protection. TOMS claims no ownership or other rights in such names or marks. TOMS reserves the right at any time to modify, suspend or cancel the Give Card program. Any changes TOMS makes will be effective immediately upon notice, which it may give by posting the new Terms and Conditions on the Website. Please direct any questions that you may have about your Give Card or how to activate your Give Card to [email protected]. These Terms and Conditions are effective unless and until terminated by either you or TOMS®. You may terminate these Terms and Conditions as they apply to you at any time by ceasing to use the Website. TOMS® may terminate these Terms and Conditions at any time immediately and without notice, and accordingly deny you access to the Website, for any reason in its sole discretion; however, the provisions in these Terms and Conditions that relate to intellectual property, indemnification, disclaimer, limitation of liability, and choice of law shall survive any termination of these Terms and Conditions. Unless otherwise specified, the Website and Content are displayed solely for the purpose of promoting TOMS® products and services available in Greece. This Website is controlled and operated by TOMS® from its offices in Greece. © 2006-2017 TOMS.gr, LLC. All rights reserved. TOMS® accepts the following methods of payment on TOMS.gr: Visa, MasterCard, PayPal. Please see Gift Cards and Store Credit for further details. Please see our FAQs for further helpful information. Select TOMS® products displayed on the Website may be available in select stores in the United States while supplies last. Please see our Store Locator for information on our retailers in the United States. All prices displayed on the Website are quoted in Euro (€). Please note that shipping dates, delivery dates, and timeframes for processing returns and refunds are estimates only and not guaranteed. We can only fulfill domestic orders to home and office addresses and do not ship to P.O. Boxes. TOMS® does not ship internationally. If you would like to ship to international locations, please see our Shipping FAQs for further information on international locations to which we ship. Item(s) that are unworn, unwashed and unaltered, or items that you believe have a manufacturer’s defect, may be returned within 30 days from date of purchase. All returnable items should be returned unused, in their original packaging and in saleable condition. Your refund will reflect the total amount you paid for the product(s) you are returning. However, you will not be refunded any original shipping costs you may have paid for the delivery of the product(s) to you. Please remember that in order for us to process your return, we must receive the item(s) within the 30-day timeframe noted above. Therefore, you must account for the time it takes for the carrier to ship your item(s) back to our warehouse in Neo Irakleio. TOMS.gr store credit (the "Store Credit") may be redeemed towards the purchase of eligible items on the Website. Any available Store Credit you may have will be automatically applied towards your next purchase. We are not responsible if Store Credit is lost, stolen, destroyed or used without your permission. Please note that store Credit is non-transferable. Purchases made with Store Credit will be deducted from your Store Credit balance, and any remaining unused balance will be available over for future purchases. Purchase amounts that exceed the redeemer's available Store Credit balance will require that the remaining balance due be paid with another acceptable payment method. Store Credit does not expire and we do not assess any service fees for non-use. WE BOTH AGREE TO ARBITRATE: You and TOMS agree to resolve any claims relating to these Terms of Sale through final and binding arbitration, except to the extent you have in any manner violated or threatened to violate TOMS’ intellectual property rights (for example, trademark, trade secret, copyright, or patent rights). Under such circumstances we may bring a lawsuit solely for injunctive relief to stop unauthorized use or abuse of the Site, or intellectual property infringement (for example, trademark, trade secret, copyright, or patent rights) without first engaging in arbitration or the informal dispute-resolution process described above. © 2006-2019 TOMS.gr, LLC. All rights reserved.